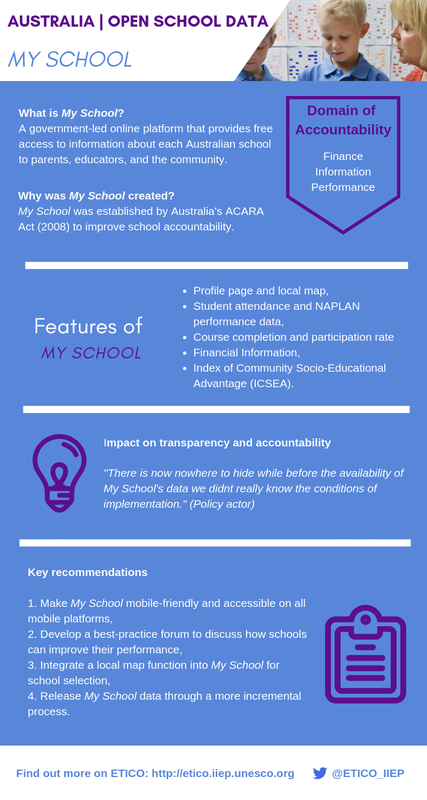 This case study focuses on the My School website, the platform for the country’s school report cards, which is managed by the Australian Curriculum Assessment and Reporting Authority (ACARA), the Australian national reporting authority. Launched in January 2010, My School is a website that provides free access for schools, parents, and the general public to information about Australia’s schools at the individual school level. The information on the My School website is collected and acquired through national consensus and agreed protocols that have been established over a number of years following determinations reached by the authorizing bodies. The mixed-method research methodology applied to this study involved an examination of key source documents, the analysis of data obtained from the semi-structured interviews with the policy, parent, and community actors, and data obtained from the written survey of school actors. Analysis of the source material and survey data were coded and categorized to identify patterns, similarities, and differences through a process of comparative analysis. Two thirds of school actors confirmed that their main purpose in using the site was monitoring their own school’s performance; some commented on related purposes such as using the site to find comparative data for neighbouring or like schools, with one describing this as ‘competitor analysis’. A third of the school actors indicated that they used the My School data for planning, and around 40 per cent mentioned its use for reporting to parents and the community, particularly through their newsletters and school annual reports. The case study discusses how to strike the balance to between displaying data, which are beneficial because widely understood by users, while minimizing the risk of misinterpretation of data. It emphasise in its recommendations the need to pay consideration to the release of My School data through a more incremental process (when data are available) in the future. Stanley Rabinowitz is General Manager for Assessment and Reporting at the Australian Curriculum, Assessment and Reporting Authority (ACARA). His responsibilities involve managing the national assessment programmes and national data reporting, including the My School website. He joined ACARA after serving as Senior Program Director of WestEd’s Assessment and Standards Development Services in the USA, and as State Assessment Director for the New Jersey Department of Education. He has intensive experience in supporting states as they design and implement new standards, assessments, and accountability systems.